I cannot forget the grand sight of Comet West with its three magnificent tails bursting upward from the horizon. 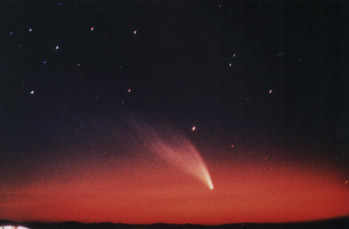 It was March 1975, about 20 years ago, and the comet was in morning twilight in the eastern sky. The tails stretched upward and looked as if it had forced itself into the Milky Way overhead. It may be the most beautiful comet on record. This occurred soon after the Geisei Observatory was built. Strangely, 231 years before that, a great comet with six bright, long tails appeared in Aquarius in morning twilight in the same eastern sky and surprised early risers. This comet of 1744 is called Klinkenberg and an excellent drawing of the comet is preserved. Many great comets appeared in the month of March. The appearance of Comet Hale-Bopp in March 1997 is still fresh in our minds.